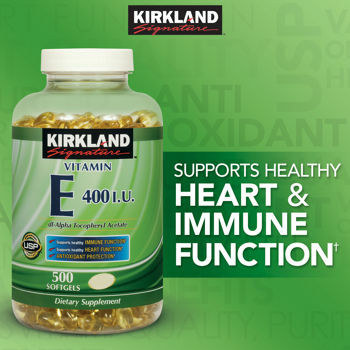 Kirkland Signature™ Vitamin E 400 IU - 500 Softgels SALE! What is vitamin E and what are the functions of vitamin E? What are the differences between the forms of vitamin E? Vitamin E is a broad term used to describe a group of eight antioxidants: four tocopherols (alpha-, beta-, gamma-, and delta-) and four tocotrienols (alpha-, beta-, gamma-, and delta-). The form found most commonly in the body, and has the greatest nutritional importance – is alpha-tocopherol. There are two types of alpha tocopherol – dl-alpha-tocopherol and d-alpha tocopherol. Dl- alpha tocopherol, the synthetic form, can be found in nutritional supplements and fortified foods. What are some food sources of vitamin E? Major sources of alpha-tocopherol include vegetable oils (olive, safflower and sunflower oils), nuts, and seeds, which can be calorically dense. Leafy greens and whole grains are also good sources of alpha-tocopherol. Many Americans (93%) fail to obtain the recommended daily amount of vitamin E through dietary intake. A vitamin E supplement may be a good option to help individuals fulfill this nutrient gap in their diet. Suggested Use: Take one softgel daily, preferably with a meal. Ingredients: dl-Alpha Tocopheryl Acetate, Gelatin, Glycerin. CAUTION: Consult your physician before taking this product if you have vascular disease (such as heart disease or history of stroke) or diabetes, are pregnant or nursing, taking medication, facing surgery, have bleeding problems, or undergoing any treatment which may affect the ability of blood to clot. No Artificial Colors. No Artificial Flavors. No Preservatives. No Yeast or Starch. Gluten free.